Boffins in America say that their new "neural interface" brain-plug equipment, intended to let users control computers and machinery merely by thinking, is about to embark on its second stage of clinical trials. The tech is intended initially to help patients suffering from paralysing illness or massive injuries, but has implications beyond the medical field. Ah, at last the caption I thought of is there. The kit in question is called BrainGate, and is under development by neuroscience, engineering and computing boffins at Brown University in Rhode Island. 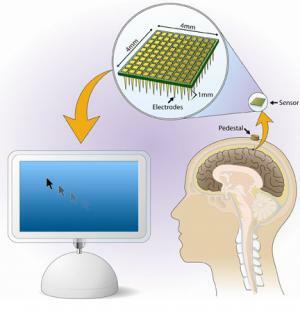 It uses a grid of electrodes implanted beneath a user's skull into his or her motor cortex, linked to a "pedestal" assembly atop the cranium. At the moment, this is hooked up by a wired connection to the BrainGate computers which interpret the electrodes' readings from the motor cortex and "turn thought into action" - for instance by moving a cursor on a screen, or operating a cybernetic limb, or directing a motorised wheelchair. Initial trials have already been carried out, according to the researchers, during which a lot was learned. However the tech is far from fully developed yet, and the second phase of trials - now beginning - is under an "investigational device exemption", meaning that the kit is still at the prototype stage and isn't certified as medically safe. Volunteers using it are acting as guinea pigs, or test pilots, as it were. The BrainGate team has lofty goals. They note that wired connections are clumsy, and furthermore that the through-the-skin plug assembly presents a risk of infection - a rather serious one, as it penetrates not just the scalp but the skull and the protective meninges covering the brain. Thus the team aim ultimately to design a fully internal, self-powered wireless brain implant to replace the present skull jack. Even more impressively, they note that in many cases of paralysis - as opposed to amputation - a patient's limbs are still fully functional. They have simply been "disconnected" from the brain's motor centres by illness or damage to the nerves or spinal cord. The Brown researchers hope to find a way of using their cortical implant to send signals to other implants on undamaged nerves controlling paralysed limbs, effectively attaching jumper leads to bridge the broken nerve connections and restoring the brain's control over the relevant muscles. In cases where the original limb is gone - the Brown scientists will be working with a lot of injured troops in this trial, as Rhode Island is home to a large US Veterans Administration research hospital - the BrainGate tech could furnish a much better and more instinctive means of controlling prosthetic limbs, powered wheelchairs etc. Initially the tech will be strictly for medical uses, of course. But if it ever becomes truly safe and convenient to use, it isn't hard to imagine people choosing voluntarily to have a BrainGate interface implanted into their heads simply for convenience. It would confer abilities roughly equivalent to telepathy and clairvoyance right off, particularly if combined with some kind of feedback mechanism - video specs, perhaps, or an equivalent of BrainGate attached to the optic nerve instead. In a sufficiently wired and automated world, it would also be effectively telekinetic: unlocking doors, turning lights or machines on and off, handling computers etc. Ultimately, people might choose to dispense with their flimsy, unreliable fleshy bodies and move instead to a more fulfilling and powerful life as chipped-up brains in bubbling jars - either moving around aboard robotic vehicles, or leading a vicarious existence via the future interwebs.